Gift giving isn't reserved for special occasions, we do it all year round at Shop Naturally. To keep waste to a minimum, our gifts are presented to you via a pop up on the Shopping Cart and Checkout pages. If you would like to take advantage of the offer, please add them to your cart. If you would prefer not to, we appreciate you leaving it behind for the next person to appreciate. The beuaty of our gifts program is that you can shop to qualify for every gift on the page, not just one. Each gift below has a qualifying spend, and as long as you meet that, you will be presented with each one. There is no obligation to take the Free Gifts if you cannot make use of them. We hate waste and the next person will appreciate your generosity by leaving it behind. DON'T SEE YOUR GIFT POPPING UP? We may have automatically added it. If we have done that, it will be listed in your Shopping Cart. If not, sometimes there is small window of time between when the last gift is taken and when we remove it from the website. If you don't see it in your cart and you don't see the pop up, we're so sorry, but we ran out. Unfortunately we can't do rainchecks. These offers are strictly while stocks last. Winter Is Coming! Get ready for chilly mornings and nights with a free cosy and comfy beanie from Raww Cosmetics. It's yours free with the purchase of any 2 Raww Cosmetics products. When you qualify, the beanie will pop up in the cart for you to add. You may add to cart or leave it behind. The choice is yours. Limit 1 per customer. If the pop up doesn't appear, we have run out. To celebrate the launch of the new Sheet Mask range from Acure Organics, we have an exclusive giveaway. Purchase any 2 products from our Skin or Makeup range - any brand, any price, any combo you like - and you can choose one of these Sheet Masks as our free gift at the checkout. Choose from INCREDIBLY CLEAR for combo / oily / acne prone skin or RADICALLY REJUVENATING for Age Performance. Make your selection from the pop up at the checkout. Limit 1 per customer. If the pop up doesn't appear, we have run out. For every $50 you spend on Boody, you have the chance to add 1 pair of Classic Bikini's to your cart for free - up to 4 pairs per customer. When you qualify, you will see a pop up at the cart and again at the checkout if you missed it. Choose your own size and colour and add to cart. You will see your gift in your shopping cart. If you qualify for more than one, add them one at a time and the pop up will continue to present itself until you have added all your free underwear. Please ensure all gifts are added at the time of purchase as we are unable to add them after your order has been processed. Spend a minimum of $30 on anything from the new SLiCK KiDS range from No Nasties to qualify for a free Biodegradable Tail Comb. $8.95 value. Any two of the liquid products will qualify you for the gift. Limited to 1 per customer while stocks last. Please add the free gift to your cart using the pop up on the Shopping Cart or Checkout Page. This will not auto add to your cart. We cannot add free gifts to your order after it has been placed. Spend $25 on anything from our natural dental range for the chance to take a travel mini of the Grants of Australia Toothpaste. Australian made and a family favourite for many, find out why this affordable natural toothpaste is loved by so many. You can choose from either the Fresh Mint or the Mild Mint flavour. Limited to 1 per customer while stocks last. Please add the free gift to your cart using the pop up on the Shopping Cart or Checkout Page. This will not auto add to your cart. We cannot add packs to your order after it has been placed. Swedish Dish Cloths are ultra fun, practical and eco friendly. They can be used to do the dishes, wipe down benches, clean bathrooms and clean up spills. They will last around the time it takes you to use 17 rolls of paper towel. Just keep putting them in the washing machine and they'll last you around 6 months. They can go on your compost pile when you're done. 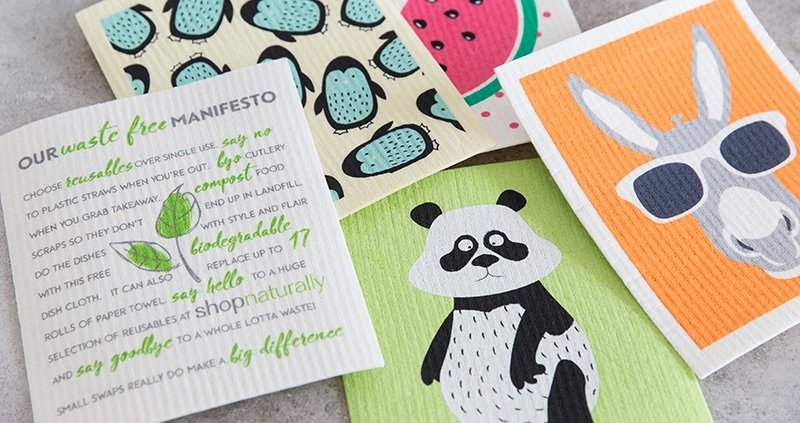 Spend $30 or more in one transaction on Retro Kitchen and you can take OUR WASTE FREE MANIFESTO cloth for free. Madara Organic Skincare is new to Shop Naturally and we are still in the process of adding the full range. When you purchase at least one product in the Madara range, you will have the opportunity to take a sample as you proceed through the checkout. If you have a specific request for a product not listed, please let us know. The list of samples is limited but will expand as time goes on.